The 11th Annual Heartland Nationals once again lived up to its billing as one of the premiere events of the sand drag racing season. Despite dodging rain drops a few times throughout the weekend, a good time was had by all and the racing action was intense. Let’s take a look at some photos taken by NSDN Editor Tom Bray at this event. The 2009 Pro Truck Nationals series kicked off on a high note with an exceptional race at the IOK 4 Wheelers facility in Cleves, Ohio. Approximately 160 entries competed throughout the weekend, with a strong turn out of 21 entries in the Pro Truck class. Let’s take a look at the weekend through photos taken by “The Editor” of NSDN Tom Bray. Thanks go out to Rich Simon for the use of his camera to take these great shots of the action. The 2009 season for the Pro Truck Nationals began with an exceptional day of racing in Cleves, OH. 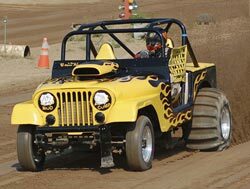 Casey Kellough waded through a tough 21-truck field to take the Pro Truck class victory over Dave Kramer in his “Super Toy” Jeep. Terry Wies laid down a nice 3.49 in the final round to win the Fastest 4WD class over Josh Stephens, driving John Dreher’s car. Pro ATV was an all-Shocker Racing final round with dad Steve Ewing defeating son Matt. Other winners on the day were Curtis Combs (Bracket 1), Chad Hill (Bracket 2), Matt Willis (ATV), Dustin Smith (Juniors), Jacob Rouse (Peewees). Update: Video now online, Click “Read More” for links. Once again the Heartland Nationals did not disappoint, with great racing action on the final day of competition. Scott Carroll took home the big money pay out back to Arizona in the Top Alcohol class defeating Michigan’s Pat Goodale in the final round. An all-Missouri final round saw Terry Glasscock take his turbo Corvair-powered dragster to the win over Jeff Sieg’s Blown Alcohol Dragster. Pro 1 saw Oklahoma’s Kevin Wilson defeat California’s Steve Foster in the final round. Tyler Knight (Pro 2 Cars) and Bobby Kincaid (Pro 1 Quads) were the other winners on the day. With the Heartland Nationals only 2 weeks away, Mother's Day weekend, and rain in the forecast the turnout for the May 9th race was down a little. Unfortunately, there was about an hour and half rain delay and then printer problems; however 6 Pro 1 Cars showed up. Jimmy Martin in the yellow Mopar Altered from Ponca City, Oklahoma had Low ET of the day. As we sit here closing off the month of April, what more can we do than reflect on the NSDA Primm Valley Spring Nationals. The race once again lived up to its billing and did not disappoint. From Scott Whipple’s electrifying 2.303 on Saturday night to April Soares’ double up in the Sportsman 1 and 2 classes to an amazing 16 car TE field to Gary Mink’s amazing 2.47 final round victory pass; there was no lack of memorable moments at that event. 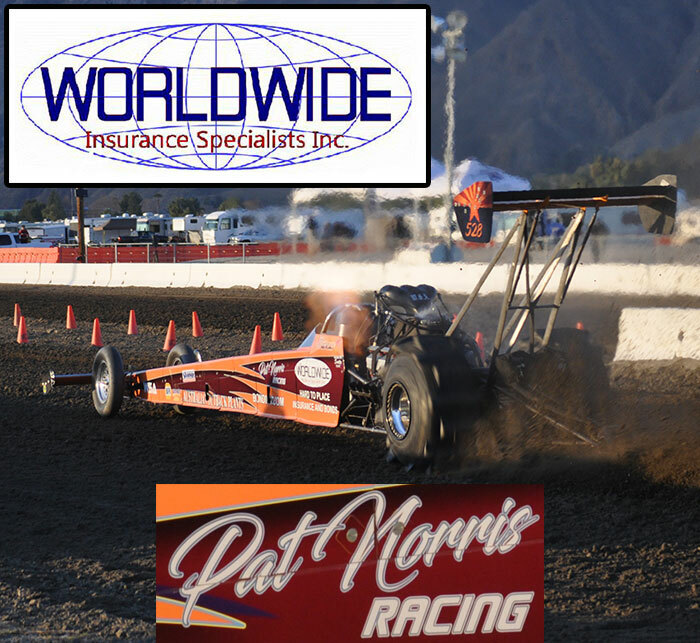 Check out the Race Recap from Primm in this month’s issue of NSDN. 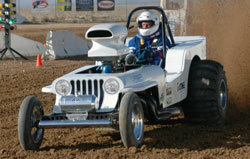 The 3rd Annual NSDA Primm Valley Resorts Spring Nationals once again did not disappoint. Despite a wild sand storm on Friday, canceling heads-up action on that day, the rest of the weekend made up for it. Read on for a recap of action in each class. West Michigan Sand Dragway in Mears, MI opened their doors for the 2009 season on May 2 with a Test and Tune day. Some different combinations were tried out as well as some familiar faces checking out what the track surface will hold in the new season. Bruce Hartung set Low ET of the day in his Turbo Four-Cylinder dragster with a 3.46. The Compromised Team of Nick Disselkoen and Steve Bobeldyk put a bigger blower on their Pro Truck and ran an impressive 3.53 off the trailer. Trent Everett debuted his new ride (the ex-Whiplash Jeep) and made some high 3.7 passes. Ben Dozeman made some test passes in preparation for the Grudge Match versus Jay Steele in the J10 Jeep Truck at the Cleves Pro Truck Nationals event. Dozeman ran a best of 3.77 on the day at 90+ MPH, showing it has a LOT of potential in the future. Around 50 total entries tried out the track on the Test & Tune day; check out some more of the cars that tested in the photos and video below. Hopefully you checked out some of the updates in our Race Updates bar from this event, we’ll do it again next weekend when WMSD kicks off their 2009 point series season. Click “Read More” for the video link from the day as well as a few photos.